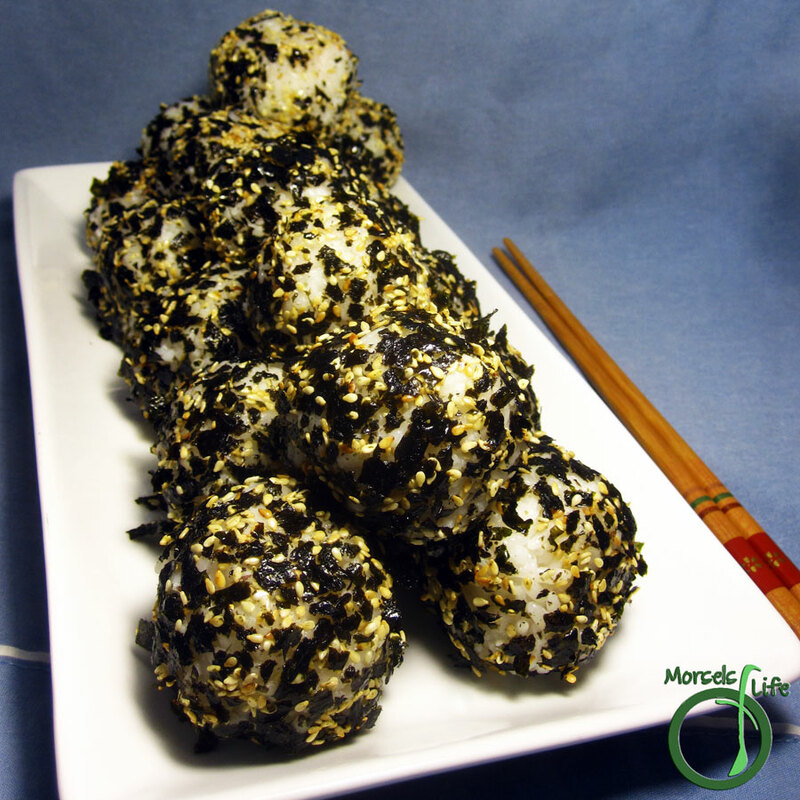 Rice, formed into balls and covered with a seaweed and toasted sesame mixture for a fun way to eat on the go. As I thought about what kind of seafood to make this weekend, I wanted something different than usual. At first, all I could think of were the usual - Garlic Salmon, Teriyaki Salmon, Maple Salmon, etc. And of course, I wanted something different. As you can guess from the title, I made onigiri, or rice balls with Garlic Salmon inside. While these rice balls are a bit more time consuming to make, the fun factor makes them worth it (at least once in a while). I also made my own version of furikake, or the totally tasty outside layer. You can also make your own or buy it at most Asian groceries or Amazon. Another option is just using toasted sesame seeds. You'll lose some of the awesomeness of furikake while saving yourself some time. First, I made some Garlic Salmon for the filling. Like most things, only your imagination limits what you can use as a filling. Some other options include shrimp, pork, rousong, and miso. After a bit of experimentation, I found dipping my hands in water before grabbing a small handful of rice kept the rice from sticking too much. From there, I squeezed the rice between my hands in roughly a ball shape. Then I stuck my thumb into the ball and filled the space with salmon. Just close up the ball, roll around some furikake, and you're ready to gobble! Although it takes a bit of practice at first, after a few balls, you'll be on a roll! What will you put in your onigiri? Combine kim with toasted sesame seeds. Set aside. Wet hands in water, and then grab a small half handful of rice. Squeeze rice into a ball shape, and then poke a hole a little more than halfway through the ball. Stick a cube of Garlic Salmon (or filling) into hole, and close up hole. Roll finished ball around in seaweed mixture or furikake or toasted sesame seeds. How unique! I bet these are great. Thanks for sharing at Must Try Monday! These look fascinating and quite tasty. I am going to have to give them a try!